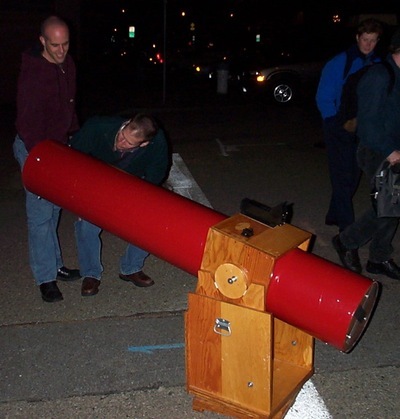 Sidewalk Astronomer Mike Portuesi shares his experiences in John Dobson's telescope making class. "You built that thing yourself?!" Every time I set my telescope on the front sidewalk, visitors ask if it is hand-built. I tell them I took John Dobson's telescope making course, taught each fall in San Francisco. Beforehand, I spoke with Ray Cash-LePennec, who had done volunteer work for the class. He told me what to expect. Week one was an introduction. We watched Dobson's telescope making video, and decided the size of telescope we wanted to build. Week two brought a 10-inch diameter, two-inch thick round piece of glass. That would be my mirror. A thinner, 8-inch diameter piece of glass was my "grinding tool." Dobson poured carborundum abrasive into the empty coffee cans we brought. We worked at home, and reported back each week. Telescope mirrors are slightly concave, to focus light reflecting up the telescope tube. To create this curve, you throw down water and abrasive, then grind the edges of the "tool" against the center of the mirror. The mirror loses glass from its center, becoming concave. The tool loses glass along its edge, becoming convex. By constantly rotating the two with respect to each other, many thousands of grinding strokes average each other out, yielding a perfect curve. Scrape scrape scrape, went the slabs of glass. Two hours into grinding, my first bout of panic set in. The mirror was to have a six foot focal length. I had tested my mirror in sunlight, and discovered the curve was already too deep! I had a four-foot mirror! To correct it, I had to grind another two hours with the mirror and tool reversed. Next week was fine grinding. Several sessions, with increasingly finer grades of abrasive, refine the mirror's curve and smooth the surface for polishing. "Tell me your tales of woe", Dobson began the class. Everyone compared progress on their mirrors so far. I hadn't even finished rough grinding yet! I took two days off from work, to "push glass" at home. Since everything is wet, it's easy for mirror or tool to slip from one's fingers, and strike the other piece of glass. Dobson often told us, "There's only two things you can do that we can't fix. One is to chip the mirror; the other is to crack the mirror completely." I did chip my mirror, but it's tiny and of no consequence. Next came polishing. It was Halloween, and Dobson presided over a witches' brew of melted pitch, bubbling on a hot plate. Dobson poured this "Mars bar" mixture on each student's grinding tool, then pressed a dowel to create grooves in the mixture. Then we pressed it against our mirrors to harden. The resulting "pitch lap" is used to polish the mirror surface to a shine. During this period we also constructed the plywood telescope mount. The tube is cardboard Sonotube, and came from a building supply outlet near my home. They asked, "Is that crazy guy building telescopes again?" I bought power tools so I could cut the plywood accurately, and read a book to learn how to use them. Once rocker box and tube were ready, I tested the mirror. Dobson said, "The curve must be accurate to within one one-thousandth the thickness of Saran Wrap." I put the un-aluminized mirror in the telescope, pointed at a streetlight on the Bay Bridge, and defocused the eyepiece. The out-of-focus patterns indicated the correctness of the curve. With millionth-of-an-inch tolerances, one can polish the mirror to the correct shape. So I read the curve, then polished for a half-hour in the region requiring correction. After six or seven tries, I was finally satisfied. The final class had Dobson inspecting each mirror. One student had built a "Lazy Susan" into the base of their rocker box, to swivel upon. Unfortunately, the bearings need more friction if the scope is to stay stationary when released. Dobson looked at their contrivance and erupted. "You silly goose! You did it WRONG! This telescope can't possibly work!" And he refused to look through their eyepiece. Moral of the story: no Lazy Susans! I took my mirror to Bob Fies, a local mirror aluminizer. He suspended it upside down in a tank, and pumped out air to a vacuum. Then he vaporized an aluminum wire inside the tank. In just seconds, the aluminum atoms collected a molecule-thick layer on the mirror surface. Building the telescope was educational, and a lot of fun. But sharing my finished scope with the public has been just as rewarding.